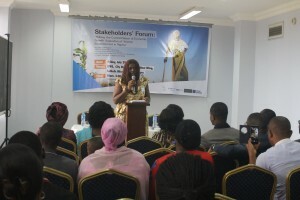 In the Nigerian context where women rarely have inheritance or succession rights to property, and are traditionally deprived of important empowering resources – in terms of access to land, education, health care, labor market opportunities – making economic growth work for women means more than reforming economic policies and programs, but also understanding the impacts of those reforms on women, and ensuring that the benefit of reforms effectively target the vulnerable groups, particularly women. Victoria Ohaeri, the executive director of Spaces for Change made this call in her keynote at the #MakeEconomicGrowthWorkforWomen Stakeholders’ Forum held on July 29, 2016 in Lagos. The Centre for Public Policy Alternatives (CPPA) Nigeria organized the forum as part of its IDRC GroW (Growth and Economic Opportunities for Women) Project in Nigeria and Ghana, with support from DFID. Just two years ago, between 2016 and early 2015, Nigeria was named the third fastest growing economy in the world by CNNMoney, with China and Qatar, taking the lead at 7.3 percent, 7.1 percent gross domestic product (GDP) growth. IMF’s 2016 projections for the fastest growing economies in Africa by GDP growth rate include: Cote D’Ivoire (8.5%), Tanzania (6.9%), Senegal (6.6%), Djibouti (6.5%), Rwanda (6.3%), Kenya (6.0%), Mozambique (6.0%), Central African Republic (5.7%), Sierra Leone (5.3%) and Uganda (5.3%). So, Nigeria is no longer on this list as was the case just less than two years ago. Why and how does this affect women? From the 2006 population census, the population of Nigerian women was put at 69,086,302. At 3.2 percent growth rate, the population of women has significantly increased since 2006. World Bank’s World Development Report 2012 finds that gender inequality – in terms of access to education, health, formal sector employment, and income – remains a significant constraint to growth in many countries. Therefore, absent serious measures in place to make sure economic development policies work for men and women, and respond to their differing needs, the gender inequality gap will widen, slowing down economic growth, leaving a potentially devastating effect on the growing population of women and children in Nigeria, not limited to poverty, unemployment, higher mortality rates and malnutrition. Why is it important to make economic growth work for women? In terms of agricultural productivity, household income in Africa could increase by up to 25 per cent; conditional upon cultural context. The rule of law. Improving gender equality in political and economic life may lessen corruption. Estimates suggest that an increase of 25 percentage points in the proportion of female parliamentarians is associated with a one-point improvement in the International Country Risk Guide corruption rating (an index that ranges between 0 and 6; a higher number means less corruption). Gender inequality in education and employment lowers the average productivity of the labour force, thereby limiting economic growth by lowering the return on new investment. So, how can the government – the public and the private sector – make economic growth work for women, especially poorer women, in Nigeria? You can only make this sort of assessment by looking at the current political decisions, economic policies and programs of government to see how women have fared under them. Let’s consider a few: economic decision-making opportunities for women, energy subsidy reform, the government’s social welfare provisions and the recent ban on street-trading in Lagos. Subsidy reforms (kerosene):Months after the changes in kerosene subsidy policy, kerosene supply challenges remain, as prices soar across major cities in Nigeria. Kerosene is a cooking fuel commonly used by the poor and low-income for cooking and lighting in Nigeria. Because of longstanding traditional gender roles which portray women as workers and caregivers in the home, women primarily do the cooking in most households. Therefore, it is safe to hypothesize that women are most affected by kerosene scarcity. Power imbalances that traditionally exist on the basis of gender have strong implications on women’s capacities to access energy products like kerosene which is predominantly used by the poor and low-income earners for their domestic energy needs. VOX says that women allocate their time between four alternatives: market work, raising children, human capital accumulation, and home production. So, when kerosene is scarce or more expensive as a result of subsidy reforms, this means that the time women would have spent on these 4 productive activities is lost and their income is reduced. Women are the ones predominantly seen at filling stations, queuing for many hours to purchase kerosene. Women are the ones forced to resort to firewood and traditional biomass to cook, with attendant implications on their maternal health. Increasing exposure to the adverse health and environment effects of unclean fuels translates higher maternal mortality rates for women, and the children that may be strapped on their backs while either queuing or cooking. The World Health Organization (WHO) finds that indoor smoke is one of the underlying causes and to blame for nearly 800 000 child deaths annually, with more than one third, that is 358 000 deaths, occurring on the African continent. Make kerosene either affordable or available—or ensure it is substituted with cleaner fuels or cooking technologies, such as liquefied petroleum gas (LPG) and clean cook stoves. The reform of economic policies in Nigeria, such as the recent changes to remove subsidies on kerosene and petrol, offer the opportunity to generate savings for financing poverty reduction programs that can benefit those in the greatest need, especially women in low-income households. One way to do this is by reallocating and efficiently targeting the subsidies on cooking fuels, such as subsidizing the cylinders, cook stoves, and other renewables which women use for cooking. A thorough understanding of the household distributional impacts on different segments of the population is necessary, in order to identify the hardest-hit sectors and groups—like women—with a higher degree of dependence on subsidized fuel. Social Welfare Programme: Nigeria’s 2016 budget excluded subsidy on petroleum products, but instead, made a N500Billion welfare provision for extremely poor Nigerians who would be direct beneficiaries of a N5,000 monthly cash transfer. An aspect of the social intervention scheme, called N-POWER, includes the provision of 500,000 direct jobs for unemployed graduates. They will be trained and deployed as volunteer teachers in their communities while still prospecting for jobs in their chosen professions. 403,528 applicants reportedly applied for this opening within 36 hours, pointing to the gravity of the unemployment situation in the country. This program shares similar characteristics with a predecessor program called the Community Services Women and Youth Employment (CSWYE) Project of the Subsidy Reinvestment and Empowerment Programme (SURE-P).To ensure women benefit from the government’s social welfare scheme, certain protective features of the rested CSWYE needs to be integrated into the current N-Power program. For instance, CSWYE expanded age bracket for women: beneficiaries must be in the age bracket of 18 to 35 years for men and 18 to 50 years for women. CSWYE also used a quota system: 30% (i.e. 1500 per state) to be reserved for women (to accommodate gender issues) These sort of gender-inclusive mechanisms are needed in all economic policies and programs of government to ensure more women benefit. Street-trading ban: Just days after it announced plans to ban street-trading in Lagos State, the Lagos State Government had since July 1, 2016, begun the full implementation of the new directive with full force. Lagos State’s quasi-security squad, Kick Against Indiscipline (KAI), has reportedly arrested hundreds of traders hawking wares in different parts of Lagos, destroying or seizing their goods in the process. The arrested traders, predominantly from densely-populated areas such as Maryland, Oshodi, Ikeja, Ojota, Ojuelegba, and Obalende, may face a 6-months jail term, or pay N90, 000 fine, or both.According to Women in Informal Employment: Globalizing and Organizing, WIEGO, street vendors are an integral part of urban economies around the world, offering easy access to a wide range of goods and services in public spaces. Most street vendors provide the main source of income for their households, bringing food to their families and paying school fees for their children. In many countries, especially in Africa, the majority of street vendors are women: 88 per cent in Ghana, 68 per cent in South Africa, and 63 per cent in Kenya (ILO and WIEGO 2013). From this data, we assume that large numbers of women engage in street-trading in Nigeria, especially on the roadsides and in front of their homes. So, this law has serious implications for women’s economic survival, including their basic rights and freedoms. They are likely to get arrested, have their goods seized and imprisoned when they fail to meet bail conditions. WIEGO finds that “low barriers to entry, limited start-up costs, and flexible hours” are the leading reasons that push women into street-trading. Most formal shops in Lagos – Tejuosho, Oshodi etc are vacant and unaffordable to low-income women. Therefore, deliberate policy measures are needed to remove the barriers and disadvantages women face in gaining access to credit, new technologies, marketing networks and spaces to display their products and services. Both policy reforms and programmatic actions are needed to deliver concrete developmental benefits to millions of women, especially those at the lower rung of the ladder: the market women, the street sweepers, the petty traders, the rural fisherwomen and farmers, domestic servants etc. These laborious occupations undertaken by poorer women have bolstered informal economic activities: created jobs; provided financial security for many households; expanded public access to basic goods and services, while contributing in no small measure to national economic growth and development. It cannot be overemphasized that recognizing women’s contribution to social and economic growth is not only essential to the achievement of human development, but also necessary for boosting economic growth in Nigeria.